Jullundur (jalandhar) surgical enterprises are importers & wholesalers of disarticulated bone set disarticulated for medical students in delhi, india. · Size: 170cm life size. · Features nerve branches, vertebral artery and hesitated lumbar disc. · Skull includes movable jaw, cut caldarium, suture lines and three removable lower teeth. Human Skeleton Model is a miniature for school to give general idea of the bones. Mounted on stand. Human skeleton model miniature height 32 cms. Human skeleton model miniature with stand - height 51 cms. Â· Comes with one hand and one foot assembled. - Mounted on a sturdy 16" wide metal base. - Made of washable and unbreakable PVC plastic. Glass Agencies EROSE are manufacturer of Human Skeleton model. 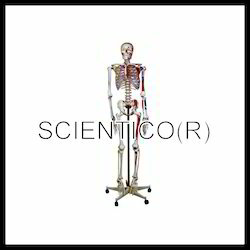 Description:This economical life size disarticulated skeleton will encouraged to learn various bones of adult human. Life-size, disarticulated adult skeleton includes 3-part skull, right hand and right foot on wire. So as to furnish the ever-growing desires of our patrons, we are engrossed in delivering a comprehensive variety of Disarticulated Human Skeleton. We are successfully meeting the varied requirements of our clients by providing the best quality range of Human Skeleton with Stand. 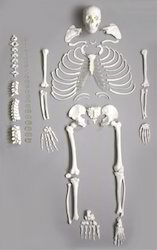 This economical, life size articulated adult plastic skeleton is ideal for teaching the basic of human anatomy. The arms and legs are removable for study. Features nerve branches, verterbral artery movable jaw, cut calvarium, suture lines and 3 wide metal base. Made of washable and unbreakable PVC plastic. Available in half and full size. Humans, including you, are born with an incredible 270 different bones! Some of these join together leaving 206 unique bones by the time you’re an adult. Our bones are strong, flexible, and pretty darn nice to have inside.